Whether you are of Polish heritage or just want to indulge in deep fried taste treats, Fat Tuesday offers a great excuse to ditch your diet, as it’s the traditional day for Polish Americans to partake of pączki. 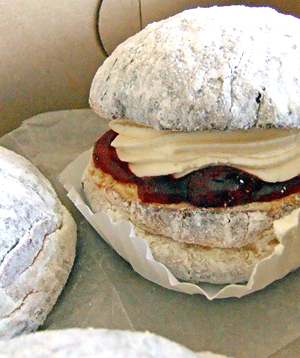 For the uninitiated, pączki (pronounced pooch-key or poonch-key) are balls of fried dough, similar to jelly doughnuts but denser and more eggy. They can be served plain with sugar, glazed, or filled with fruit or cream. Traditionally, making pączki just before Lent was a way to use up items like eggs and lard, which would be abstained from during the pre-Easter season. 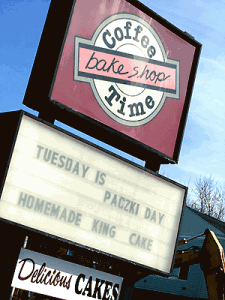 Salem’s Coffee Time Bake Shop has a reputation for making the rich pastries, and this morning while suffering the hell that is the Bridge Street construction, we spotted their sign reminding us that today is pączki day. Seizing the chance to duck the traffic, we popped in and purchased a few. The coffee shop produces plain and several stuffed varieties, priced from $1.89 to $3.50 each. The decadent cream- and strawberry-filled option was tasty, and the whipped cream was fresh, but it was overwhelming. A bite and a half was plenty. The raspberry fruit-filled was very good, but our favorite was the unfilled glazed. 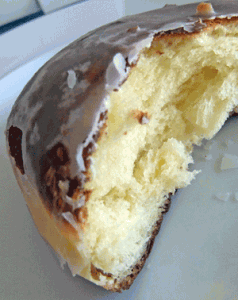 The glaze provided just enough sweetness, and the flavor of the dough was still discernible. Coffee Time makes fresh, hand-rolled pączki daily at this time of year and will have them available now through Easter Sunday. The pastries are more of a bread dough than a doughnut, so we advise purchasing them early in the morning. The ones we tried were terrific, but I can imagine they dry out pretty quickly. They offer a huge array of baked goods, doughnuts, and cookies and has other seasonal baked goods, including king cake for Mardi Gras and Irish soda bread. So if you find yourself waiting to be waved on by one of the endless police details lining the street, a pastry break might just be in order.